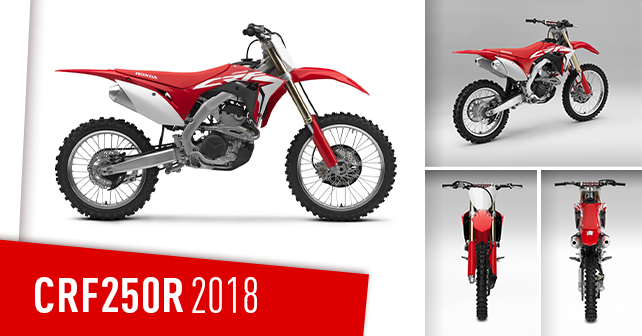 Its official, Honda has released the new CRF250R 2018. 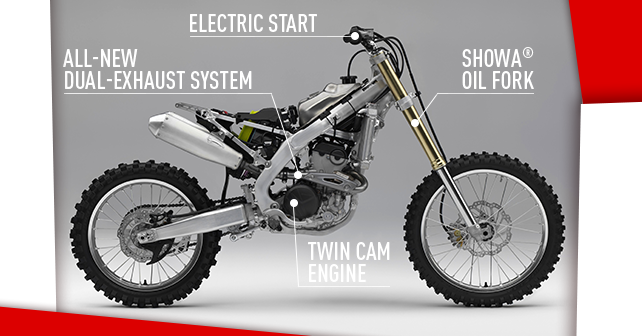 Based on the same philosophy as the CRF450R, the new design follows the same performance focused update guidelines. The bike received a complete relook but you probably ask, what’s new under those plastics? Let’s find out! The new CRF250R shares almost everything from the 2018 CRF450R and almost nothing from the previous model. First come first, the engine. Honda gets rid of the old Uni-cam 250cc engine and develops a new and improves dual-overhead –cam design. The new engine features larger intake valves, bigger bore and stroke, larger exhaust valves and also a finger rocker arm with Diamond Like Coating. The trademark dual exhausts are now a true dual exhaust. Honda added a dual exhaust ports instead of one who split in two. More power and rev range in a smaller and lighter engine, that’s a great update. Like the 2018 CRF450R, the 2018 CRF250R feature an electric starter powered by a lightweight lithium-ion battery. The starter and the battery only add 1 kilogram to the bike. From the handlebar, you can choose from three maps : standard, soft and aggressive. It is possible to customize these two last one to your personal taste. You probably noticed it from the first look; the new Honda CRF250R received a complete makeover and look like his big brother, the CRF450R. He also has a brand new titanium gas tank to replace the old plastic one. Honda redesigns the frame by shorting it, increase ground clearance and lower the gravity centre. The swing arm has been shortened to increase the ground traction. Honda changed their old air forks with a new coil-spring fork made by Showa. With a lower shock mount, the new CRF250R show more stability and a better centralized feeling. Go visit the Honda Motorcycle web site for further information and discover the complete motocross line up. Visit your local Honda dealer to grab your new Honda CRF250R. Find all you are looking for such as motocross equipment and much more at Kimpex. With its 2 distribution centres and over 50,000 products available, Kimpex is the Canadian leader in the distribution of parts and accessories for motorized sports. Located in Drummondville, Québec, the company has a network of more than 3000 retailers in Canada and the United States. Go to www.kimpex.com. Discover other great industry news on the Kimpex News.